The AWS master section stereo compressor is based on the legendary G Series bus comp and can be assigned to either the REC or MIX stereo busses. Activated, the AWS Stereo Bus Compressor instantly adds cohesion and strength to your mix without compromising clarity, bringing the classic SSL "audio glue" to your mix with spectacular SuperAnalogueTM audio performance. Combined with improved input and output circuitry, this improved unit provides superb audio performance, while retaining the dynamics characteristics that have provided numerous hit mixes for the world's best audio engineers. Two classic SSL Channel Dynamics processing strips with separate Compressor and Gate/Expander sections can be assigned to any channel. The assignable Channel Dynamics section features SSL's standard RMS compressor, switchable to Peak sensing, with hard knee characteristic via the "PK" button. There are separate controls for the Expander/Gate section encompassing range, threshold, release and hold. Expansion is selected via the "EXP" switch. Each processing strip includes dedicated metering, fast attack buttons & dedicated key input. The AWS features comprehensive talkback routing with dedicated independent communication buttons for independent foldback sends. A full compliment of GPIO connection, SLATE, the famous LMC input, and RED light activation are all standard on the AWS. The AWS offers a new level of sophistication when working with control room monitoring. The centre section affords total control over two independent 5.1 main loudspeaker outputs plus two stereo "mini" LS outputs, and a dedicated Headphone Out. Comprehensive Bass management is also included. 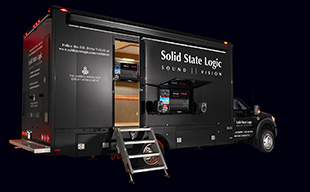 A highly flexible external source selector section can sum, assign and route up to four 5.1 sources, and four stereo input sources to either the control room, studio loudspeaker and headphone foldback feeds. A six channel wide monitor insert point and a separate six channel external meter output allow full interfacing with additional third party monitoring systems and 5.1 surround encoder/decoder combos. There is a dedicated Stereo VU meter for the MIX, REC, Monitor and Solo busses, a VU Phase meter, 5.1 monitor metering, 8 individual Track Bus meters and all Cue and FX send level indication. Each channel sports a dual 12-segment meter which allows DAW Stereo track monitoring. Other features in the AWS include AUTOCUE functionality, MONITOR VOLUME POT CALIBRATION, SOLO ISOLATE, the ability to control two DAW's simultaneously, and the addition of SOFT BOOT power cycling. Above all, latency free punch in record monitoring is standard, this is analogue! 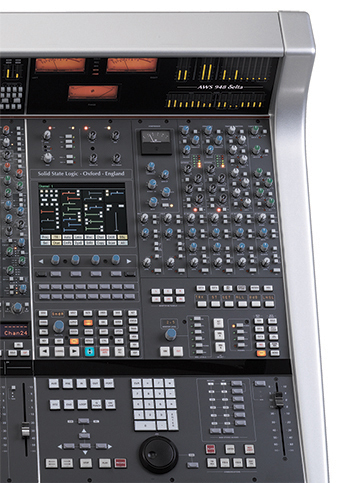 TotalRecallTM is SSL patented technology that aides the saving and recalling of analogue console control settings for a specific Project or Session. The system takes a snapshot of current console settings and saves it via the SSL Logictivity Browser. On the AWS a graphical representation of this information can then displayed on the Centre Section TFT display to enable the operator to manually reset the controls. The AWS includes the timesaving "TR Autoscan" feature which draws the operators attention to only those Channels that need adjustment. To accommodate modern production methods the AWS consoles now feature an independent Summing Input which allows additional Tracks from the DAW access to the Cue and FX send busses, therefore allowing those DAW tracks access to hardware outboard units and the creation of dedicated Cue mixes form the DAW.